Recognise your employees with flair when you present them with an award from our Premium Awards selection. 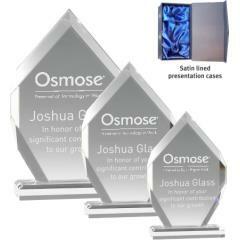 Choose from colourful art glass, crystal & chrome fusion, stylish & contemporary plaques & honour boards; we've got an award for every one of your high achievers. THE PREMIUM COLLECTION Our Premium Collection features the clarity and brilliance of Rikaro Crystal, and the clean modern lines of the 'Fusion Collection' acrylic/stainless steel awards. We've also included a selection of brilliantly coloured crystal awards and some really 'out there' designs, to make your presentation stand out from the crowd.